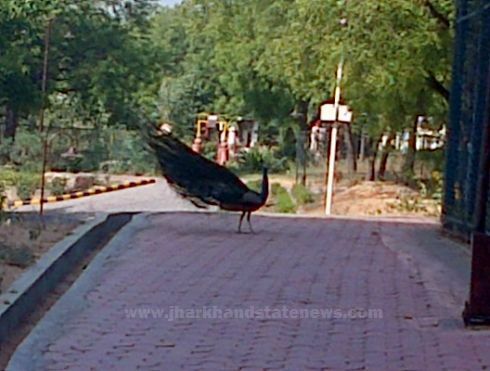 Picture by Rupa Sinha for www.jharkhandstatenews.com shows peacock in New Delhi. By Manoj Prasad: Shocking it may sound,Kolkata is turning out to be the hub of peacock smugglers.Many of them operate from Jharkhand where they acquire the national bird and illegally transport them to the capital of West Bengal for sale in Kolkata.In consequence,it seems,the day is not far when peacocks will become a rare sight in Palamau Tiger Reserve and Dalma Wildlife Sanctury in Jharkhand. Aware of it,the Jharkhand state forest department had chalked out a strategy to keep vigil on the poaching and or smuggling of peacocks from Palamau and Dalma.Though the search operations initiated by the forest department in 2014,has come to a halt now,the smuggling of peacocks continued. “This is a major crime committed by a number of criminals.Due to absence of efforts by the forest department and the police,none of the criminals were caught.Even the state government has not bothered to contain the crime”,said a senior Indian Forest Service officer in Ranchi. 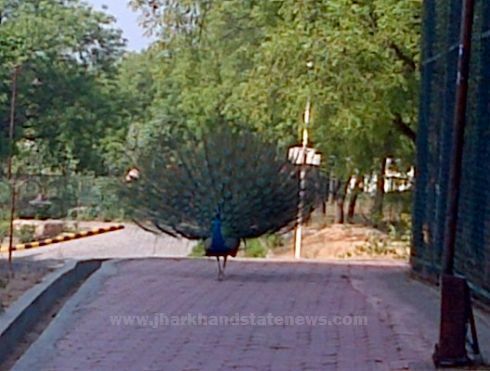 www.jharkhandstatenews.com has learnt that villagers of Betla in Palamau and Narga, Barki, Sagdih, Pipla, Kuting, Kesarpur, Narsinghpur and Bhilai Phari villages in West and East Singhbhum district of Jharkhand also hunted peacocks and hide the birds in their homes. “When the peacocks lay eggs, the villagers mix them with that of chickens so that no one can suspect. And then the chicken is made to sit on the eggs. When the eggs hatch, the villagers smuggle them to Kolkata in West Bengal”,said the same IFS officer. More often than not,it is learnt, smugglers from various states of Assam,Bihar and Jharkhand gather in Kolkata to buy peacocks to sell them in other parts of India,including New Delhi.”They earn Rs 500 to Rs 1,000 for a young peacock. Those who buy the birds further smuggle them to neighbouring countries like Nepal, Bangladesh and Bhutan at a very high price”,said another forest department officer. Data gathered show,the price of an Indian peacock is pretty high in the international market. Sadly,as the Palamau Tiger Reserve and Dalma Wildlife Sanctuary in Jharkhand continue to have peacocks, the smugglers of the national bird thrive in the absence of any move to contain the horrific crime in the forest. Can you end this national crime ? Page rendered in 0.1861 seconds.